There have been no important economic reports to influence GBPUSD and now traders are considering UK Manufacturing PMI and Trump’s speech to Congress. 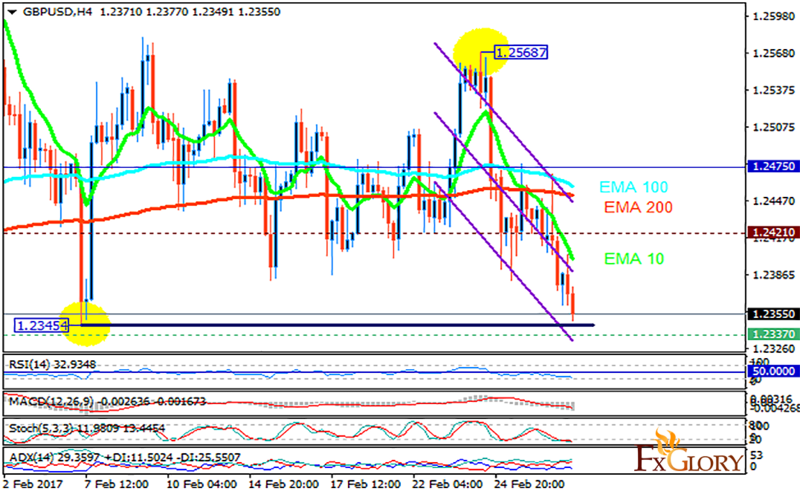 The support rests at 1.23370 with resistance at 1.24210 which both lines are below the weekly pivot point at 1.24750. The EMA of 10 is moving with bearish bias along the descendant channel and it is below the EMA of 200 and the EMA of 100. The RSI is moving in oversold area, the Stochastic is moving in low ranges and the MACD indicator is in negative territory. The ADX is not showing any clear signals. The support area seems to be strong to be broken therefore GBPUSD must be starting its correction pattern soon targeting 1.2567.